At the time of writing my previous entry on (milder) misogyny, I’d had no idea of the details of the last mass shooting in the US. It’s a sad state of affairs that all I could think of when I heard about it was that I didn’t need the details, and that it was probably another privileged white male. Some things you don’t have to be psychic to know. 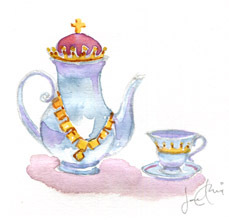 Royal Tea: A punny little watercolour, May 2014. Odd mix of links, but then again, this is my usual range of reading material. I don’t even include channelings. Everything is Broken But maybe not how you were thinking. Some of us are never given the tools to get through life’s traumas. In a perfect world, it’s our parents who comfort us as children, teaching us how to self-regulate our emotions. Unfortunately, crying and anger aren’t always met with compassion, and so we learn how to repress our feelings to avoid the consequences. We teach our children—especially young girls—to be people pleasers from a very young age, choosing emotional responses that are agreeable rather than authentic. Nuke Cancer from 9/11 Revealed I’d had no idea “toxic soup” was still accepted as an explanation. Ascension Angel’s Amazing Miracle Broth Looks like a good one for my vegan days. Proper post will come after I get on top of my work. It’s been busy around here lately!